Transaction windows or pass through windows are typically used for security and privacy purposes across all industries. Municipalities, healthcare, retail and banking all need transaction windows in their course of business. Transaction windows can be fixed or operable sliding or with secure transaction drawers or shelves. We are able to provide extreme protection with ballistic rated or bullet resistant glass and threat or tamper resistant materials. There are several different accessory options for voice transmission, deal trays, pass thru or transaction drawers. Doctors’ offices and most check-in counters in health care need to have privacy windows with glass enclosures at check in per HIPPA regulations. 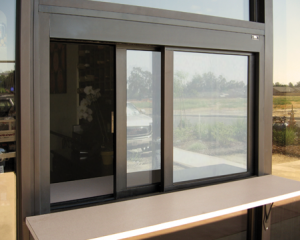 These pass through windows can be with a simple sliding wicket window or as elaborate as the situation requires. We stock standard nurses station window parts to be able to quickly provide fixed or sliding wicket windows when needed. Banks, Police Stations and Detention Facilities all have a need to provide safety and security for activities that demand tough rugged materials that are designed to keep the bad stuff out and the good guys safe. We offer Level 1, II, III & even level IV ballistic rated windows to stop small or large caliber fire arms. Threat resistant transaction window materials can stop intruders in their tracks.